Other number GLC-675-2889 Verso Neg. No. 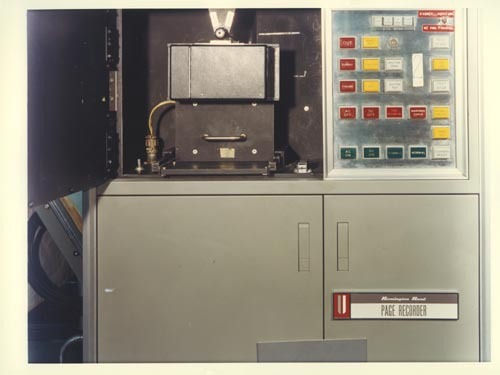 Color image of the UNIVAC LARC Page Recorder. Label: " Remingtopn Rand page Recorder with UNICAC icon. To the right top is control panel with buttons. To the top left a door is open to show recording mechanism with pull out drawer. Verso: Paper label: " Lawrence Livermore Laboratory University of California Graphics Division"